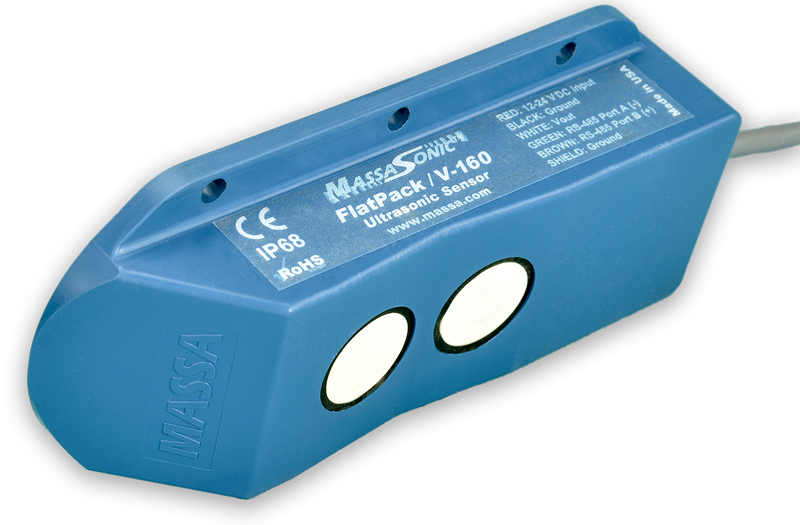 The MassaSonic FlatPack® Non Contact Distance Measurement Sensor is a low profile transmitter. These sensors are optimized to provide continuous non-contact distance measurement of fluids, pastes, or uneven solid bulk materials in constrained working zones for application ranges from 1 inch (25 mm) to 13 feet (4 m). Read more in “Flow In, Flow Out”, an article in the October 2018 edition of WaterWorld. Incorporating state-of-the-art dual-transducer ultrasonic technology and processing algorithms, all FlatPack Series Sensors provide precision measurement for factory automation, warehouse materials control, pipe and conveyor belt blockage, or tank level applications with non-uniform surfaces. FlatPack Sensors are also ideal for monitoring in-pipe flow levels of renewable energy systems. Because of the unique dual transducer design with 15° system beam angles, it is unlikely that the maximum range capabilities will be much affected by solid materials with uneven surfaces, as occurs with single transducer sensors with narrower beam angles. The FlatPack non-contact sensor is RoHS compliant and IP68 rated. They are field proven designs and come in a PVC housing suitable for use in all-weather resistant moderate chemical environments from -40°C to 70°C. An integrated mounting plate with pre-formed holes is provided for easy installation. All models are equipped with continuous temperature compensation to ensure precise speed of sound calibration and measurement accuracy. Other user friendly features include diagnostic and monitoring outputs, protection from over voltage, short circuits, and reverse polarity. Contact a Massa Applications Specialist to discuss your specific sensing needs.